There was terrific turnout at last Sunday's Family Diversity Playdate - among the many families who attended were six new to TPS this year. 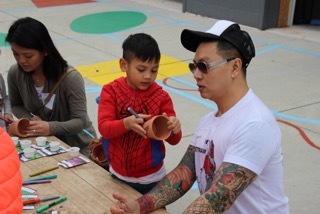 The playdate took place in the TPS Garage and Garden. The children planted seeds and had a great time getting to know each other in our wonderful garden. Parents mingled and got a chance to connect as well. TPS Diversity CoordinatorBrian Johnson and FDC co-chair Nina Rivera reviewed our current year's activities and facilitated thoughtful conversation about possible activities for next school year. Special thanks to Janay Brown who facilitated seed planting activity. Remember to water those seeds! Happy Springtime from the Family Diversity Committee – Bob Prischak, Christine Chisholm, Janay Brown, Christy Santoro, Martin Wiley, Quanda Robinson, and John Stone.